Back Pain: Are You Sitting Comfortably? Home > Back Pain & Work > Back Pain: Are You Sitting Comfortably? Chairs have been around for perhaps thousands of years, but have only been used regularly for about the last 500 years. Most people spend many hours each day sitting – at work, at home, and in the car, train, tram or bus. Not sitting properly can put a lot of strain on the back, either causing back pain or making it worse. Sitting Up Straight – Or Not? 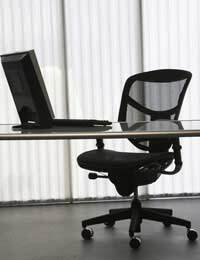 Slouching and slumping in a chair may feel comfortable, but after a while, it does put a strain on the back. However, it’s not enough just to ‘sit up straight’ (remember being told this at home and at school?) Studies conducted at Woodend Hospital in Aberdeen, Scotland, in November 2006 showed that sitting bolt upright is bad for the back, as is sitting hunched forwards over a desk. The position that puts the least strain on the lumbar region of the back (the lower part of the back, where back pain is most common) is one where the angle between the body and the legs is about 135 degrees – so sitting and leaning slightly backwards, or using a wedge-shaped cushion to slope the legs downwards slightly. This will also help to keep the natural S-shaped curve of the back. Big, deep and soft sofas, overstuffed chairs and beanbags look very inviting but aren’t necessarily good for the back, especially not for long periods, because they don’t provide enough support. To help with back pain (or to help avoid it), it’s better to choose a straight chair with a firm seat and back, where the feet can be flat on the floor – use a footrest if this helps. Sit as far back in a chair as possible, with the buttocks and back against the back of the chair and feet flat on the floor, and the hips level. Lean against the backrest to support the upper and lower back – a lumbar support (a firm, roll-shaped cushion) or a rolled up towel in the small of the back may help. Avoid sitting with legs crossed – this puts strain on the back and is bad for the circulation as well. Some people spend many hours a week in the car, and getting the seat position right can help to prevent back pain, or stop it getting worse. Make sure that the car seat is adjusted so that it supports the whole length of the back, and sit right at the back of the seat, with the seat back leaning back slightly. All the controls and the pedals should be within easy reach, without having to stretch or twist too far. Driving with elbows comfortably bent and both hands loosely on the wheel, at about 3 o’clock and 9 o’clock, helps to keep the back straight. If the car has more than one driver, don’t forget to re-adjust the seat if someone else has been driving. However comfortable the chair, it’s important to get up and move around every so often – from every half an hour to every couple of hours.